Sleep experts agree that sleeping on our backs is the best position, allowing our head, neck, and spine to remain in a neutral position throughout the night (Medical Daily). In this guide, we're going to share some practical advice on what you need to consider when choosing the best mattress and pillow for back sleepers, as well as our top product picks, to make sure you are fully supported night after night. What's the best mattress firmness for back sleepers? 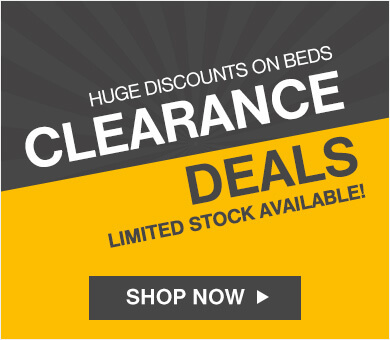 What's the best mattress depth for back sleepers? What are the benefits of sleeping on your back? The soldier: when the legs are mostly straight with arms down by the side. The starfish: when the legs are straight and apart with the arms up above the head. Savasana: when both arms and both legs are fully extended. Whatever your preferred back sleeping position, we've got you covered. Back sleepers typically prefer mattresses that are a 7 or 8 on the firmness scale, which equates to a medium-firm or firm comfort grade. When it comes to choosing the right mattress for a great night's sleep, this is one of the most important considerations. Mattress firmness is determined using a scale of 1 to 10, with 1 being the softest and 10 being the firmest. The majority of mattresses on the market range from 3 to 8, and back sleepers generally like to be at the top of that range. Ideally, back sleepers want a firm mattress with an even surface that supports the whole body and keeps your spine properly aligned, without sinking too deeply. Proper support is vital for long term sleep health, helping to prevent the aches and pains associated with misalignment. Depending on your weight, a medium–firm mattress will typically provide enough support to keep your spine aligned, while having enough give to allow your hips and shoulders to nestle in. It is important that the top layer of your mattress can fill in the gap between the lower lumbar region and the mattress to contour around the spine and allow it to fully decompress. Exactly what level of firmness you choose is a matter of personal preference but, generally, the heavier you are, the firmer your mattress should be. Closely related to firmness is mattress depth. How thick your mattress is can be an equally important consideration, especially if you are on the heavier side. The more weight that is on the mattress, the more it will be compressed, and therefore the deeper the mattress should be. Think about it like this: if you are on the heavier side, a soft mattress will need to be thicker than average to prevent you from sinking to the lower, less comfortable layers of the mattress. The ideal mattress thickness is relative to a combination of your size, sleeping style, and mattress type. It's obvious that a side sleeping 20-stone man on a soft foam mattress will need a much thicker mattress than a woman of 8 stone lying on her back on a hard mattress. Because of this, there are no hard and fast answers. But we can talk about mattress depth in general terms. The thickness of your mattress can be a contributor to aches and pains, and you shouldn't buy a new mattress until you understand how it may affect you. If you need a lot of support, then a thicker mattress will be better. Back sleepers typically want a mattress with a minimum depth of 15cm–20cm that provides great support for the buttocks and shoulders, as this will help to keep your spine properly aligned. The final consideration when choosing a comfy mattress is its construction. One person's perfect mattress may not be right for someone else, and the materials it's made of are a big factor in this. Memory foam, pocket springs, Octasprings, and latex are all excellent choices, and each brings its own advantages, whether that is comfort, breathability, or support. Many of the best mattresses are hybrids which combine two or more of these materials in different ways to create unique sleep experiences. Exactly what material or combination of materials you choose is largely a matter of personal preference, but you can find out more about each sleep technology in our mattress buying guide. Be careful when trying different mattress types in store, as they will likely all feel pretty comfortable. Sadly, you won't be able to properly test it in this time as the aches and pains of misalignment typically won't develop for a few nights. For this reason, it has become more popular for people to buy a mattress that comes with a trial period, allowing you to try the mattress out for a certain number of nights. 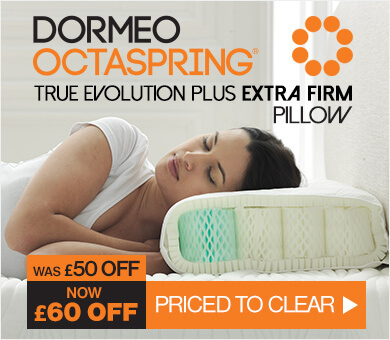 You can find out more about the trial offered by Dormeo in our 60-Night Comfort Guarantee. With all this in mind, we've put together our top five best Dormeo mattresses for back sleepers. If you're looking for a great value mattress that will keep you fully supported as a back sleeper, then you won't get much better than the Dormeo Options Hybrid mattress. By combining the unrivalled comfort of memory foam with the dynamic support of up to 728 pocket springs, this mattress will have you sleeping like a baby. It's essential that back sleepers get a mattress with a strong core support system to maintain optimal alignment, and pocket springs are a fantastic way of doing this, With individually wrapped springs cushioned in their own pockets, the whole body is supported. The other added bonus of pocket springs is that they distribute weight evenly and are much more resilient to dipping over time. With air mesh sides, which help move humid air out and bring fresh air in, you'll be kept cool all night. This great all-rounder will stand the test of time and is ideal for back sleepers, combining the best of multiple sleep technologies so you can drift off. 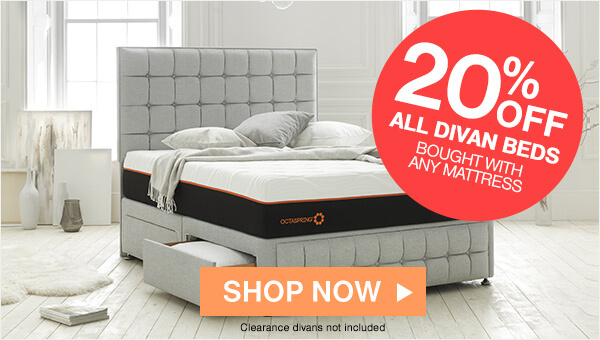 For unparalleled comfort and support for back sleepers, look no further than the Octaspring 7500, an Octaspring memory foam mattress that utilises a layer of luxurious latex to give you an amazing night's sleep. This mattress is ideal for relieving the common aches and pains associated with back sleeping — usually in the neck and lower back — and contouring to your body to ensure total all-round support. This luxurious mattress provides the ultimate in memory foam comfort with innovative spring technology. Two layers of Octasprings work together to create three different body zones, so you have support tailored to your head, torso, and legs. What's so great about Octaspring construction is that you get the benefit of memory foam, without the drawback of trapped heat. Octasprings have eight times more breathability, so you'll be kept cool throughout the night. With so many different sleeping positions, it's not uncommon for couples to have different mattress preferences, which can lead to disagreements. To make sure everyone gets the sleep they deserve, we created the Dormeo S Plus: a completely customisable sleep experience with over 30 different comfort combinations, so you and your partner will both be able to get a perfect night's sleep. Combining Octaspring technology with a configurable S-shaped Ecocell core, the S Plus is a truly fantastic offering that can be configured for every sleep position — ideal if only one of you is a back sleeper. The design of this mattress has been inspired by the natural S-Shape of the spine, the S Plus mattress is designed to provide perfectly contoured support and comfort. Two connected cores work together to allow you to personalise each half of the mattress and quickly interchange them as and when you need to. 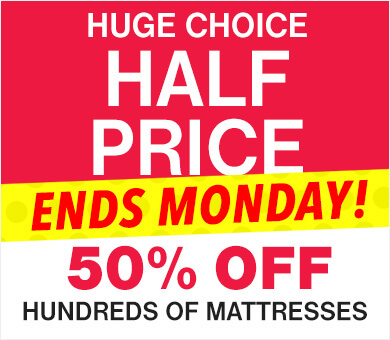 This makes the S Plus a risk-free choice for couples who can't agree on which mattress is right for them. 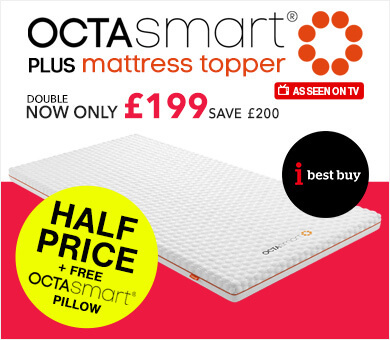 Buy today and you'll also get a free Octasense 2-in-1 memory foam pillow. If you have bad allergies, or just want the most hygienic sleep environment possible, our Aloe Vera Memory Foam mattress is the idea choice for you. With anti-allergenic protection designed to keep dust mites and bacteria at bay, you'll have a healthy sleep night after night. Not only that, but it is also enriched with Aloe vera, which is renowned for its natural healing properties, as well as its ability to rejuvenate health and beauty. Aside from these health benefits, this mattress is also fantastic for back sleepers. This mattress combines two layers of foam to create a balanced and supported sleep. A memory foam top layer keeps you feeling comfortable and supported, while an elasticated Ecocell core provides efficient air circulation and contouring. If you're a particularly hot or heavy sleeper, we would generally recommend getting a mattress with Octaspring technology. This is the thinnest mattress on this list, and heavier sleepers may want something a little thicker. 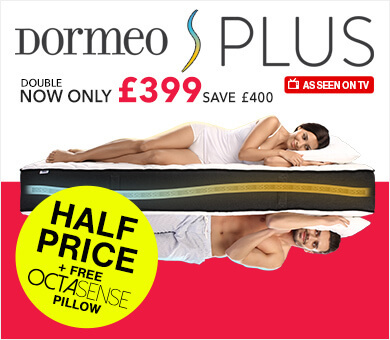 Buy today and you'll get a free Memosan Anatomic memory foam pillow thrown in. While memory foam is one of the best materials to get a comfortable sleep, it does trap heat and can become uncomfortable for particularly hot sleepers. To get maximum comfort, you need to be kept cool throughout the night. That's where the Octaspring Tribrid comes in, combining all the latest in sleep technologies: the comfort of memory foam, the bounce of pocket springs, and the support of latex, to keep you cool every night. This is a dream combination that is perfect for back sleepers who tend to get hot in the night. This mattress has been constructed with breathability in mind. With a core of up to 1,365 individually wrapped pocket springs, transfer of movement is kept to a minimum, which is ideal if you have a partner that tosses and turns in the night. Five body zones with differing strengths will contour each part of your body, while a bouncy and thick top layer will keep both heavy sleepers and couples happy. Back sleepers have the benefit of achieving natural spinal alignment when lying down and don't need cushioning in the same way that side sleepers do. That said, the choice of pillow can make a huge difference in sleep quality, especially if you already suffer from aches and pains on a regular basis. Thicker pillows typically offer more support for the head and neck, which can also help to minimize snoring in back sleepers. Back sleepers tend to prefer medium or high loft pillows as they keep the neck and head elevated, helping to maintain proper spinal alignment. Pillows with a low loft can cause the head to drop back, which can lead to snoring as well as the development of aches and pains. When it comes to materials, back sleepers generally need a pillow that is firm and thick, but other considerations include airflow and breathability, odour or allergy protection, and cost. When you spend a third of your life asleep, the last thing you want is to wake up in the morning feeling tired, or worse, with headaches and chronic pain. To help you overcome this problem, we've selected our best pillows for back sleepers. For fantastic back sleeping comfort at a great value price, the Memosan Anatomic pillow is an ideal choice. Get the comfort of memory foam in a specially designed anatomic shape that works brilliantly with all sleeping positions. As a back sleeper, the shape will contour around your neck, providing total support for your head and supporting your spine's natural alignment. The high-quality memory foam is also resistant to dust mites, so it’s great for allergy sufferers. If you're looking for the ultimate in night time comfort, look no further than the Octaspring True Evolution Plus. Filled with the latest in sleep technology, its memory foam springs provide unparalleled support and breathability. The unique honeycomb structure of Octasprings offers eight times greater air circulation than traditional memory foam pillows, meaning that you're always sleeping on the cool side of the pillow. Designed for all back sleepers, this pillow properly supports the head while keeping the spine aligned, preventing any undue pressure on your neck. If you change sleep position from night to night, or simply want more control over your comfort, the Octasense pillow is a versatile choice, suitable for back, front, and side sleepers alike. It has been designed with an innovative 2-in-1 construction, combining an Octaspring tube with microfibre filling that can be adjusted at will. With classic and anatomic support, this pillow adapts three-dimensionally to your neck and back, while offering top breathability and ventilation. Not only that, it also has anti-bacterial treatment, making it a great choice for anybody suffering from allergies. Some people get hot every night and find it incredibly hard to sleep. With that in mind, we created the Fresh Classic pillow, specifically designed to provide incredible support and comfort for side and back sleepers, using temperature-sensitive memory foam pieces that adapt to your head and neck to keep you fully supported throughout the night. The dual-action pillowcase is designed to keep you cool and fresh night after night: one side is made from Coolmax, which actively draws away moisture providing a cool and dry sleep, while the other is made from breathable Airmesh, which allows hot air to escape. If you often wake up with neck or shoulder pain, it's likely that your pillow is to blame. 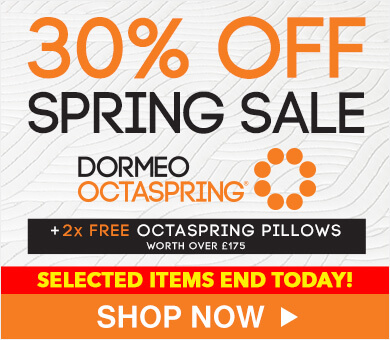 The Octaspring True Evolution anatomic pillow has been specially designed to avoid aches and pains, so you can wake up feeling fully refreshed every morning. Combining the comfort of memory foam with the breathability of Octasprings, this pillow offers the best in neck support. With 35 independent Octasprings working together, your head and neck will always be cradled, no matter how you move. Fewer back and neck problems: The main reason that sleeping on your back is so beneficial, particularly for you neck and spine, is that your weight is evenly distributed across the mattress. Because the body is flat and straight, rather than focused on a particular point, pressure is felt by your whole body at once, meaning that no one area is taking on an excessive load. If you are someone who has chronic back pain or you sometimes wake up with aches, switching to back sleeping could be a huge benefit. If you do struggle with back pain, why not check out our fantastic back pain guide. Decreases pressure on your muscles: In a similar vein to the above, sleeping on your back can help to relieve muscular tension throughout the body. By spreading your body weight, your neck, shoulders, lower back, and legs can all be equally relaxed, with no undue strain on any one area. Not only does this help relieve any muscular pain, but it can also lead to improved sleep by relaxing your muscles. Reduces wrinkles on your face and neck: Sleeping on your side or front can cause wrinkles, also known as sleep lines, on your face. These lines tend to appear along the temples, around the eyes, and across the cheeks and mouth. Fortunately for back sleepers, this problem is avoided altogether, keeping your skin looking nice and smooth. This also prevents facial asymmetry, which can occur after years of sleeping on one side. Not only that, but it can help to reduce inflammation and promote cell turnover in the face. Less swelling on your face: Much like wrinkle reduction, back sleeping can also help reduce facial swelling. Some people often wake up with a puffy face, especially around the eyes, but this can be minimised by back sleeping. When you lie down, fluid can pool in certain areas, but this is avoided by sleeping on your back. Sleep apnoea: Sadly, it's not all good news for back sleepers as this position could predispose you to snoring because your airway is more likely to become blocked. The other downside is that this can lead to pauses in breathing, known as sleep apnoea, which can result in gasping, choking, and other symptoms such as daytime tiredness. It is important to bear in mind that sleep apnoea can occur without evidence of snoring. You now know everything you need to about sleeping on your back. Whether you've been doing it all your life or you're thinking of switching, get yourself the perfect mattress and pillow for back sleeping and get the rest you deserve.